Every few years, I go on a life sabbatical. Life sabbaticals work differently than educational sabbaticals mostly because they are not real. The notion that there are people who receive paid time to disappear somewhere to have a temporary life that doubles as a say-no-more way to avoid other social responsibility is magical. “No, no, I won’t be here to chair that research project, I will be away on sabbatical.” versus “Well…you’ll just have to have that IEP meeting for my kid without me, I’ll be on life sabbatical. 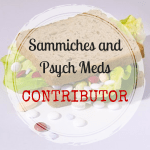 Have your people call my people” doesn’t quite have the same heady ring to it and might necessitate a call to a mental health professional. Unlike our neurotypical cohorts, many of us special needs parents are preparing for a forever life. Though we feverishly plan for it, there might not be a high school graduation send off party unless of course that party is sending off what few resource and assistance waivers our children got before they age out of the system. Diapers and tantrums are likely going to get larger. With the passage of time I am already finding myself getting smaller, more tired and more complacent in the frenetic searching, learning and advocating as certain realities set in. This is troubling. Apathy is the ugly stepsister of passion. While passion will gladly cut off a chunk of heel to make her foot fit into that glass slipper in hopes of a prince, apathy will do so because its easier to make do than to shop for something to wear to the ball. Endless details and inconveniences are just part of daily life in parenting regardless of circumstance. Its like the service charge for the privilege of parenthood and an occasional break from that is necessary for even the strongest of mommy constitutions. However, there are those of us who are so steeped in the present at all times where there are rarely idle moments not spent trouble shooting, even in the middle of night as we play musical beds and double-check doors. So I am mindful in the moment and I am mindful in that moment contemplated 30 years from now. The whispers of all the things that will come in between need to shut the hell up because I simply have no room at the inn left to consider those things. As caregivers we are told to take care of ourselves, take time off, do what we love. This seems like cheap advice and when heeded I am reminded that ultimately not much is different on my return. The airline may have lost my tagged luggage of anxiety while I was away, but it is surely taking a circular ride on the carousel at gate 6 when I arrive home. Time away takes me to places from my past. A time when existential angst was poetic, selfishness was better defined as a deep level of internal awareness and laziness was a sleep credit I could one day consider cashing in. The dichotomy for the surrendered love for your child and also wondering what it would be like if your heart didn’t bleed through your blouse every day is a quiet and unreasonable Sophie’s Choice. Sometimes its just easier not to be a tourist in your alternate universe. In my life sabbatical, I am lucky to be able to spend a few days away from my forever life with soul companions from my past who live in sleepy mountain towns in New England. Their lives are so vastly removed and different from mine, yet anchor me to a world where I once lived. Lingering, casual vegan meals out where my fork is already unwrapped and folded into a crimson origami pocket on the table. Conversations are still tangential but are about politics, performance art and anecdotes of escapades in places like Nice and Machu Picchu. I meet new people—interesting people who talk about ideas and experience rather than people or events. Though these conversations have evolved over the years and now include points about how difficult camping at high altitudes can be with stiff morning joints and schlepping a c-pap machine, I am transported into a life of things that were once very important to me. Supportive friendships not sullied in the day-to-day. I can have amnesia and even forget that words such as “occupational therapist’ and ‘trash day’ and ‘bus bully’ ever slowly seeped into my repertoire of significant and meaningful topics of interest. While recently on one of these life sabbaticals, serendipity appeared in a cameo. In an unexpected and out of my control change in travel plans, I had the opportunity to attend a reading of a famous contemporary writer with cult-like status. His prolific works speak to anyone who has ever had a family or even just been alive despite the level of quirk and shock and neurosis woven through his stories. There is a distended familiarity in his writing and when he lends his voice to the story telling it feels like you were reading the original works in the wrong dialect of a foreign language you learned in high school. That epiphany of disappointment of what was missed in the original reading is quickly tempered by excitement to re-read in the voice and inflection intended. Book signings are often part of these events and this writer is certain to ask each fan a question and attempt to tailor a sentiment attached to how he feels about them in the moment. And he can be honest. And brutal. And weird. And sometimes all. But regardless of what is written, it is enough to brandish your signed copy around to show everyone how he thinks you smell like coins. He is a story-teller and I believe he likes to stoke fires and create the story to be told even when he isn’t directly the voice. While he briefly engaged my theater dates for the evening, I already had a question posited regarding his physical writing process. I thought if I asked him something preemptively I could kill our allotted time without ruining my self-esteem. “You wrote for such a long time pre-PC. Was it difficult to make the transition from handwriting your ideas to typing them out? ” He answered and asked why I was asking. I guess I should have realized that was possible as a visitor in my sabbatical of the impossible. “I used to write a long time ago. And then I didn’t. And now I am trying again but now there are computers and expectations. And its hard.” I started reaching for my book he had not yet finished signing, but he continued. “What do you write?” Oh crap. I looked at my anchor friend who was smiling at me and nodding and guessing he must not have seen the poor young woman ahead of us get eviscerated over her cheap perfume. “Its just a blog”. He reached back to put something on the floor behind him and continued. “What do you write about?” He still wasn’t done signing my book otherwise I would have grabbed and ran…..the door was still ajar. “What kind of disabilities?” he asks without pause (door squeaks open a bit more). And there it was. Door now wide open. Mouths of theater dates wide open. Hole in my heart wide open. A). a creative genius and there is nothing like making people uncomfortable or angry to get to hear some real truths. C). Has absolutely no filter and has potentially is on the spectrum himself. Which would make sense if you have ever read any of his stories. This one is familiar to me. And also likely the thing he purportedly hates about said distant relative. Regardless, I had to respond. We stared at each other for a time that was a few seconds longer than comfortable. After I got over the “I’m really angry and I don’t care if this is a schtick for ideas or even if he has autism himself” I grappled with “THIS FAMOUS WRITER MIGHT READ MY BLOG!” HE’S GOING TO HATE IT!” (#humblebrag) I spat out Running Through Water. 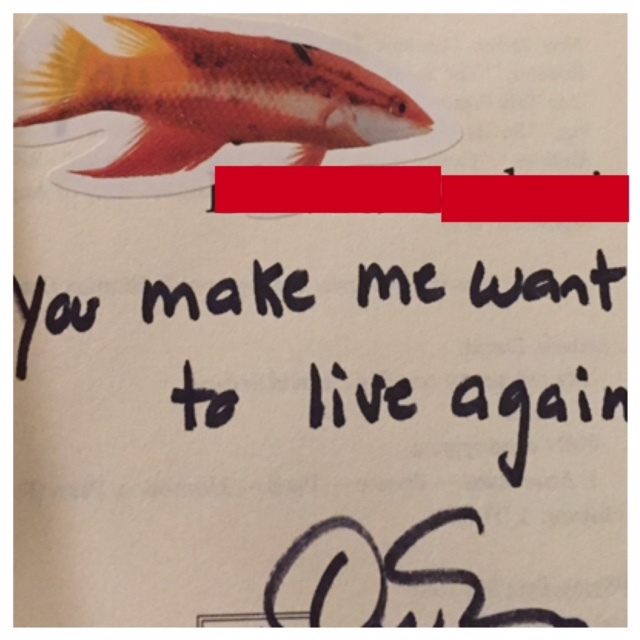 I peeked at my book where he had put two fish stickers over the writing errors he had made to both cover up his mistake and also call great attention to the fact he made them in the first place. “You make me want to live again” he wrote. Every day is an opportunity to live again with new perspectives our old selves could not have imagined.